A simple random number generator using 8051 microcontroller. AT89S51 is the controller used here. A Â random number generator using 8051 that displays a random number between 0 & 99 is shown in this article. The circuit itself is very simple and may not find any applications in serious embedded projects and this article is just an illustration. The circuit is based on AT89S51 microcontroller, two seven segment LED displays, two transistors and few passive components. The two seven segment LED displays are multiplexed together and their data lines are connected to Port0 Â of the microcontroller. Transistors Q1 and Q2 drive the corresponding displays D1 and D2. The driving signals for there transistors are obtained from P1.1 and P1.2. Push button switch S1, capacitor C1 and resistor R10 forms a debouncing reset circuit. Resistor R9, capacitor C2 and pushbutton switch S2 will provide an active low hardware interrupt signal at INTO (pin12) whenever S2 is pressed. Here also R9 and C2 are meant for debouncing. After power ON the display will show blank and when push button S2 is pressed the display will show a random number between 0 and 99. For another try, you have to press the reset switch and then switch S2. If you need a single digit setup only, then remove the display D2 and itsÂ associatedÂ components. Everything else is the same. The first part of the program is the portion labelled MAIN which sets the initial conditions and the interrupt parameters. The next part is the loop named LABEL which loads 99D to register R6 Â then decrements it by 1 until 0 and then repeats the cycle again. This is the part which generates the random number. Every time R6 is decremented the resultant value is moved to accumulator A. Next part is the interrupt service routine which is written as a subroutine named ISR. Whenever there is an interrupt at INT0 (push button S2 is pressed), the ISR is called. The ISR performs necessary mathematical manipulations on the content of A in order to split out the two digits and then proceeds to show it on the display. Subroutine DELAY produces roughly 1ms delay for switching the displays. Subroutine DISPLAY adds the current value in A with the address stored in DPTR (starting address of LUT) and moves the target content to A. The result will be the digit drive pattern for the current digit in A. Thanks a lot for the project for Microcontroller programming startups. can anyone post .hex file for this program? can i know which display is used for this project reply fast plz…..
e.g. common cathode or common anode display . aap ne kaise banaya h. plz meri help karo mere pass sirf 6 din h.
Good job. I love this. 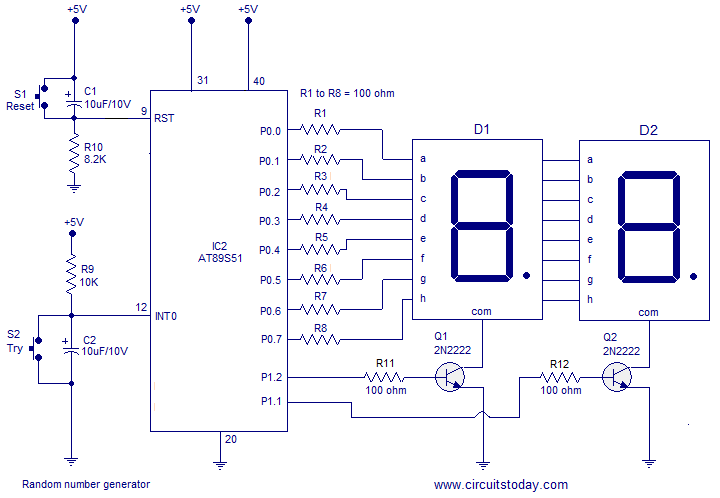 Please I want to design this circuit for a 6-digit number display. How do I go about it?